The 320 Series Pole Mount Single Monitor Articulating Arm from Ergotech Group is a versatile, economical articulating arm for use with most monitors under 24". This pole-mount-style desk clamp model has a spring mechanism allowing a combined 23.5" inches of total height adjustment along a 14" pole and 23" of horizontal adjustment; aluminum dual arms for articulating at two points; and a tilt mechanism which angles at 90° up and 40° down (pan is 180° and rotation is 360°). The arm has a weight capacity of 0 to 19.8 lbs, and will accommodate both 75 and 100 VESA-compatible monitors. Warranty is 5 years. The Concerto Pole Mount Monitor Arm from KV Waterloo is a stylish, easy-to-install pole-style monitor arm that offers monitor elevations up to 22" above the mounting point. 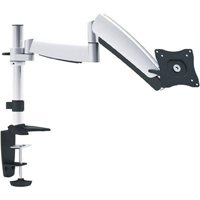 The dual-jointed articulating extension arm freely swivels 360° around the 18" mounting pole. The pole offers 12.75" of vertical height adjustment and the spring-loaded second extension section of the arm offers a 6" range of height adjustment from any position. 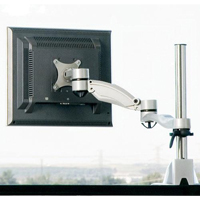 This arm is equipped for both desk clamp and grommet hole installation and comes with cable management to keep cables neat, and fits monitors complying with VESA 75mm and 100mm hole patterns.